Dallas Austin is a well known Grammy award-winning music producer who was referred to WebXperts. He approached WebXperts to create a website for his studio in 1999. He wanted high-end design, cutting-edge functionality and something that had not been seen on the Internet before. The new website was launched in 2000 and won critical acclaim. Dallas came back to WebXperts in 2007 to build a large scale web portal to compete with MySpace™ (which was the #1 social network at the time). He wanted to automate the process of musicians sending in their music for consideration to producers. 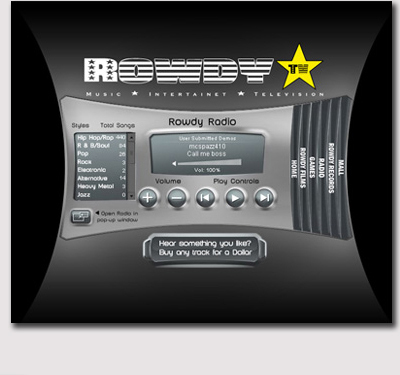 WebXperts consulted with Dallas for over a year before launching the Rowdy Music Portal, which was supported by his label Rowdy Records. The website sustained high traffic while it was online and was a pioneering idea during an evolving time in the music industry. WebXperts designed, maintained, and hosted this pioneering web portal from 2007 to 2009.